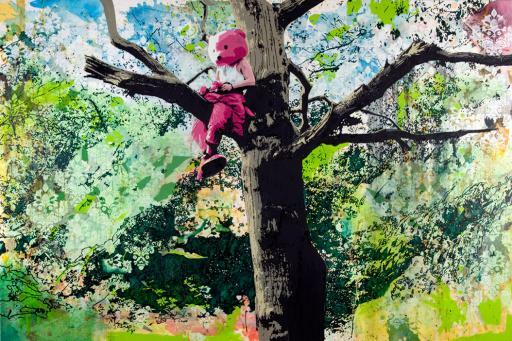 In his debut solo exhibition with Andipa, New Contemporary artist Paul Robinson produces a vivid collection of paintings, photography and unique prints telling the fantastical story of alter ego Pink Bear. 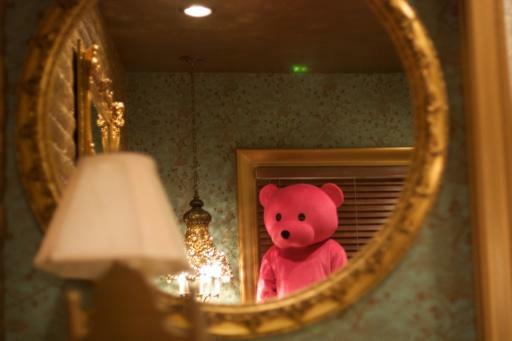 Existing in and between physical and surreal environments, Pink Bear reincarnated from an old childhood memory, leaving the familiar confines and security of youthful innocence to find a place in the ‘real world’. 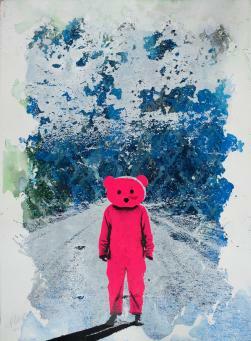 Travelling through isolated landscapes and barren abstract worlds representing the physical and psychological paths navigated through in life, Pink Bear looks for purpose, searches for connection and seeks new meaning. In each piece, Robinson is candid in creating a moment of compassion, allowing for empathy and leading the viewer to reflect on their own journey. 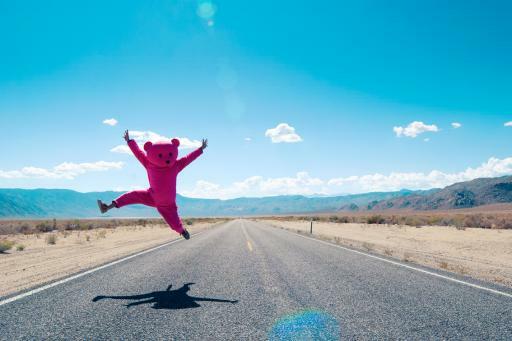 In 'Jumping Bear' we see the hero travelling along a deserted highway jumping in high spirits ready for the journey ahead. 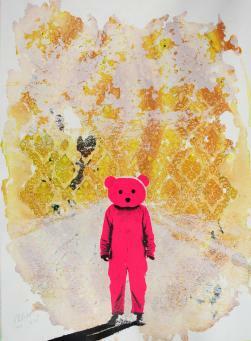 The bright naivety of this piece and 'I [heart] Daydreaming' then becomes a stark contrast to works such as 'Fail Guard', exploring the realization of mortality and 'Motel Bear', touching on self-discovery and reflection. 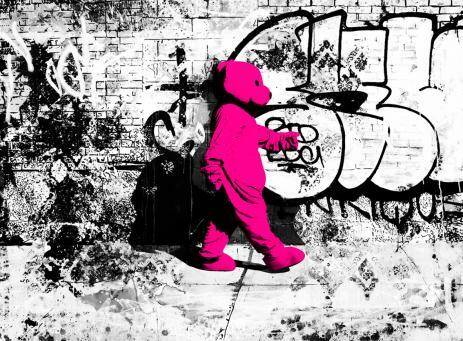 As Pink Bear continues the search for meaning in 'Williams Bear-G', our hero finds himself out of place, lost in New York City, surrounded by crowds of people and tall buildings yet alone, separate to his environment, experiencing the world from the outside. Confronted by conflicts of identity, mortality, strange people and situations, he is corrupted; influenced by allures of entertainment, sexuality and derelict social culture. 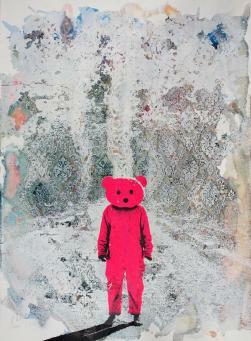 Throughout his adventure Pink Bear catches glimpses of pureness, personal connection and belonging. In these moments he comes closer to capturing the true source of his happiness and fulfillment. 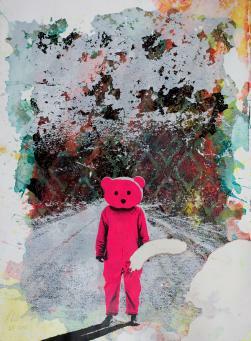 In the painting ‘Me and My Shadow’, we see the bear walking down an empty road through what appears to be an endless abstract landscape. He is near the end of his journey, yet there is no particular destination in sight which suggests this could be the beginning of a new journey, along a different path. 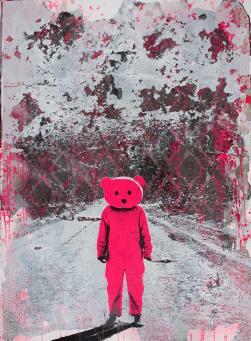 expressionism infused with the explosive energy and bold colour of Pop and Urban Art. Exploring existential subjects within a contemporary feel his work stands alone in its composition and provoking content and subject matter. 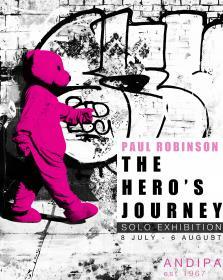 Paul Robinson is a British artist currently living and working in the UK.